A photo taken at a company presentation allegedly showing the new GTV sports coupe has leaked online. When Alfa Romeo announced it was revealing a new mystery concept car at the 2019 Geneva Motor Show, we were hoping it would preview the new GTV sports car or the upcoming 8C mid-engine supercar. Instead, the Italian automaker unveiled the Tonale, a stylish concept previewing a future compact crossover. All is not lost, however, as we may have been given a sneak peek at the reborn GTV earlier than expected. Originally posted by Italian fansite ClubAlfa, the leaked photo was allegedly taken during an internal company presentation, showing a part of a render of the new GTV sports coupe. 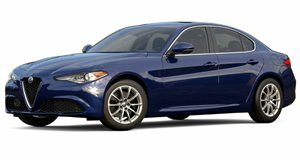 It seems to match the shadowy render released by Alfa Romeo and is essentially a two-door coupe version of the Giulia sedan, although it looks curvier and more aggressive than the Giulia. No other information has been leaked, so it will probably be a long time before Alfa releases any more official details or photos as the new GTV isn’t expected to arrive until 2021. A GTV spider convertible will also reportedly launch 18 months after the coupe in 2022. Hopefully, the Italian automaker will preview the GTV with a concept car before the production version launches in a couple of years. The new GTV will be a front-engined, four-seater sports car, essentially making it Alfa Romeo’s answer to the BMW 4 Series, Audi A5, and Mercedes C-Class. Being based on the Giulia Quadrifoglio means that power will be provided by a 2.9-liter V6 engine. Unlike the Giulia, the GTV will feature a hybrid powertrain. Reports suggest the V6 will be tuned to deliver around 460 hp, while an electric motor will increase the output up to around 600 hp and offer an electric range of 30 miles when running in EV mode. While its predecessor was only available in front-wheel drive, the new GTV is expected to be available with rear- or all-wheel drive.